For the first net damage the Runner suffers each turn, you may look at the Runner's grip and select the card that is trashed. This ID is very interesting to me and I think needs a lot more testing, and could possibly explode in power if given the right tools. The biggest advantage of this identity is that it terrifies the runner from wanting to run until most of their rig is out. Common knowledge dictates that the way to play around PE type decks is to not run until most of the cards in your hand are tolerable to lose. PE can poke at your by scoring a few things themselves, but the damage is random and PE tends to run a lot of easy-to-score 1 point agendas to shave you as much as possible. The only big agenda they tend to use is #the future perfect, so when they try to score it early you can usually wager if the damage risk is worth 3 points, which it usually is. This means that handing some early tempo to PE so you can safely set up is annoying, but usually not that bad, since they might get 1 or 2 points/damage. Chrono Trigger here ramps that initial pressure up immensely, and when used correctly, this ID should theoretically almost guarantee you an early game lead. Almost all the cards that proc the ID can only be used if the runner runs (Neural EMP, ice, Shock!. And since even 1 or 2 damage early on means the runner WILL lose the most valuable cards in their hand and lose a buttload of tempo, the smart runner will (and should) essentially concede the early game to the corp so that they can set up their rig/econ in peace. In PE, this means getting 1 or 2 points. 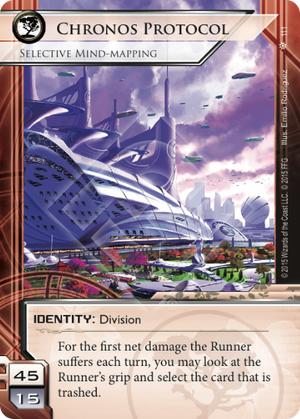 In a Chrono deck with some good rush potential, this could mean the corp getting 3-4 agenda points and setting up their own economy practically uncontested. I shouldn't have to tell you that being halfway to victory before the runner even starts running is a big, fat, sweaty advantage so infuriating and pressure-heavy it might as well be a Yolo t-shirt in a vice. Kala TV - While most people glossed over this card as a "good but not good enough" type of card, I think it has some real synergy with Chronos and Salem. By dropping this early, you know almost everything the runner is drawing, meaning you know what to name for salem, thereby getting chrono procs without doing damage at all. Plus, while ChroPro has massive control over your hand and you can add trash effects to gain (possible) control over the field, Kala TV extends your control to a new area: their deck. By smacking what the runner wants out of their hand, being able to trash things off their field and making sure they never even GET the vital tempo-reviving draws they need, you are effectively controlling literally every aspect of the runners game. Plus Salem is an alliance card, and 3 J-How plus 3 KTV is 6 influence and makes your 3 Salem witch-hunts TOTALLY INFLUENCE FREE. Again, this is all theoretical, but I find it hard to deny the potential power of this deck. In the hands of an experienced player, this shell could be the single most gut-wrenchingly scary ID to face in the game. The soul-crushing surgical dissection of your deck and demoralization of never having what you want, never keeping what you want and never getting what you want, this could be one of those decks that loses you friends. This ID is like Jinteki: Personal Evolution on steroids. I'm terrified of being a runner when this card comes out. Here's why. As any one who's ever piloted or played against a "Thousand-Cuts Blacktree" deck, the real threat isn't the flatline. Sure, the double-Ronin kill is a possibility, as is the possibility of a click-three Komainu or Psychic Field followed by double Neural EMP, so you have to be wary of those things, but that's not the scary part. No, the scary part of Blacktree is that if you run at the wrong time, you could lose essential cards that you're keeping in your grip. If you are holding back on dropping that Gordian Blade until you see a code gate get rezzed, you might hit a Shock! or Snare! and lose it. If you're waiting for the opportune moment to make a Notoriety or Quest Completed run, you might lose that card before the opportunity presents itself. Chronos Protocol takes this possibility and makes it an inevitability. Because it's really, really easy to do one point of net damage at a time. And when that damage happens, you are guaranteed to lose the most valuable card in your hand. House of Knives becomes "House of ohgodwhy" as you strip away everything the runner knows and loves..three times. Neural EMP isn't just for flatlines anymore. Put one Shock! in Archives and laugh as you pick their brain apart. Cortex Lock absolutely must be broken every time, until they hit full MU. Fetal AI is even more frustrating than it already was. Hokusai Grid coupled with the upcoming Ancestral Imager becomes the ultimate rock-and-a-hard-place scenario. And so on. I expect to lose against this ID many times in the next year. Maybe this is the time to bring back Net Shield, or try out that new Synthetic Blood.